This is most questions or scenario we encounter I had encounter while working CRM and that is we want to load Live Environment Data to Test/UAT or Development environment. I decided to give it go and following are detailed step to achieve this in CRM 4.0. STEP 2: Restore this database on Dev/Test Database Server. Let’s assume our development database server name SQLDEV and we restored this database with name SQLDEV_MSCRM. It is important to have last string in database name as _MSCRM. 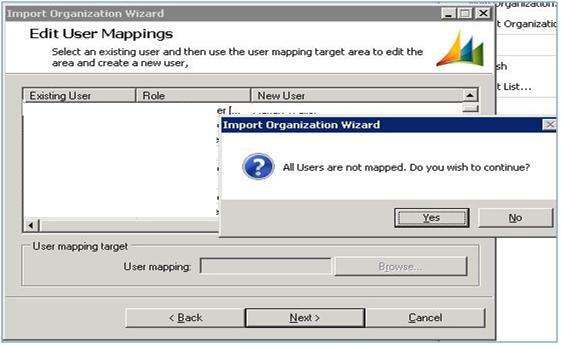 STEP 7: Now select the mapping of user as per your requirement, you create mapping file and use that for user mapping. For this example we will keep it simple and just use to auto map users using AD account name and click Next. STEP 10: the system will show you Ready to install screen with all summary of new CRM Organisation. Click Import button. System will then create new dev environment with live data. STEP 11: Done, You will see the success screen and if there is any problem you can check installed log file and the correct problem and start again. 1. You need to be Active directory administrator to be able to do this. 2. This will not do any extra add-ons or custom development which is not part of database so you will need to manually do this on new CRM Environment. 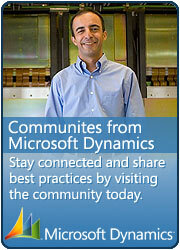 This entry was posted in CRM 4.0, Others and tagged Dynamics, Tips & Tricks on August 6, 2010 by mayankp. Just a quick question. How did you install this instance of CRM in the first place? I installed it and it created a test dev as TESTDEVCRM_MSCRM or something but that’s the name I want to keep. If I import the new organisation as the same name what is going to happen? I just don’t get the import organization thing. Did you just not provide a database name when you installed or something. if you want to keep the same organization name then you need to delete existing organization and delete relevant report folder then you can import it..otherwise not..
What about the Customizations that are developed using .Net?? as per Note 2 in above article, you will have do them separately again. Is there any custom web site you got in .Net? if yes then they need to separately put in to new test environment.